To me, the choice is pretty clear. So long to the baseball season. I knew the Tigers were finished when Game 1 and Pablo Sandoval's three home runs went in the books. I didn't even bother sticking around to see if they could pull out Game 3. In 2006, the Tigers couldn't play defense. This year, they couldn't hit. The San Francisco Giants are one of my least favorite teams in all of baseball. But my dislike for the Cardinals runs deeper. I was so disinterested in the National League Championship Series, initially, that I didn’t even bother watching the first three games. I half-heartedly watched Game 4 and Game 5. 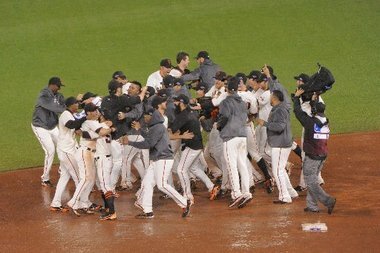 But the Giants heart and excellent play in Game 6 moved me, and I was fully on their side for the clincher. So it was a sweet sight to behold tonight as the Giants crushed the Cardinals, coming back from three games to one and winning Game 7. The umpires weren’t stopping that game for nothing. And the slowed images of the falling rain drenching the Giants players as they amped up for the post-game celebration were pure art. Finally, Matt Holliday – of all people – popped the ball to your NLCS MVP Marco Scutero -- of all people – putting an interesting end to the series after the two were involved in arguably the signature play of the series. That rules. RT @mlbbowman: Cardinals end their season with an infield fly. Meanwhile, my beloved Prince Fielder, Jason Verlander, Miguel Cabrera, Jim Leyland and the rest of my beloved Detroit Tigers are back in the World Series after sweeping the Yankees. ... There's no doubt that series was over the moment Derek Jeter fell hurt. While I hated to see that, I loved every other minute of watching the Yankees' collapse, especially the at-bats involving Alex Rodriguez. I just hope in this World Series that the Tigers pitchers remember how to throw to first base. "In this day and age when we have instant replay available to us, it has to change. These (umpires) are under tremendous amounts of pressure. It is a tough call for him because the tag is underneath and it's hard for him to see. And it takes more time to argue and get upset than (to) get the call right." "There is too much at stake, and the technology is available. That's what our country has done. We have evolved technology to make things better." The Yankees were on the wrong side of a couple bad calls in the ALCS, and I can't help but wonder if the Braves season wouldhave ended differently if that infamous infield fly was reviewed immediately. a No Tony. No Albert. No problem. a Andre Dawson emerges from the ivy and into the spotlight ... I do enjoy this commercial. Oh, the baseball gods have not been kind to me this fall. First, the Braves last weekend. Then the Reds went down. The Orioles couldn’t break through against C.C. Sabathia and the Yankees last evening. The first round of baseball’s postseason unfolded spectacularly into a full week of high and prolonged drama. Each of the four matchups lasted the full five games, and one after another the unlikely moments came: The Oakland Athletics overcame a two-run ninth-inning deficit Wednesday against the Detroit Tigers to stave off elimination for another day. Raul Ibanez of the Yankees bashed a pair of late, dramatic home runs against the Baltimore Orioles during an unexpected pinch-hitting cameo for Alex Rodriguez. The San Francisco Giants won three straight games away from home to advance past the Cincinnati Reds. And the final moments of the opening round, which played out just past midnight Saturday morning in Washington were perhaps the most unbelievable. We successfully put Faye down for the night after we finished dinner – which last night was, after a long and hectic week, Applebee’s takeout around our coffee table and in front of TV as the Yankees finished off the Orioles. Then Phoebe made a cozy spot for herself to watch the game from the floor; about midway through the Cardinals-Nationals game, I noticed the unusual silence in the room and looked down to see Phoebe zonked out. Kates was fighting sleep, too, gave in and headed to bed some time in the seventh inning. Meanwhile, I was determined to stay awake to see the Nationals move on to their first league championship series and continue to warm the hearts of Washington, D.C., and baseball fans everywhere. I dozed off for the seventh and eighth innings and into the ninth as well. The Nationals had led the game by as much as 6-0, and it appeared they were going to survive another feisty comeback effort by the Cardinals. Later, the Nats were up 7-5 and needed just one more out to eliminate the Cards. I was fighting hard to keep my eyes open long enough to witness the celebration. Then Carlos Beltran doubled for the Cardinals. Nationals pitcher Drew Storen had two strikes on Yadier Molina and David Freese, and he walked them both. The bases were loaded. Now I was having flashbacks to the heartbreak of last year’s World Series when the Texas Rangers twice had the Cardinals down to their last strike and eventually lost the game and the series. Now I was wide awake. Daniel Descalso hit a hard shot up the middle that skipped off shortstop Ian Desmond’s glove. Two runs scored and the game was tied. In another blink of the eye, Peter Kozma singled, knocking in two go-ahead runs. The Nationals went quickly in the bottom of the ninth inning. And it was over. I laid on the couch in shocked disbelief. Again. From the Packers-Seahawks game to the Braves-Cardinals game to last night’s saga, it’s been a disappointing fall in the sports department. From here on out I'll be rooting for the Detroit Tigers, a team that's had a hold on my heart since they hired Jim Leyland and nearly won it all in 2006. If only those dang Cardinals hadn't stepped in their way that year, too. ... Now our boy Prince Fielder is with the Tigers, which gives us more reason to root for them. Those dang Cardinals got in Prince and the Brewers' way last year, too. Nevertheless, social media in these situations never fails to fascinate me with the ways it brings millions of people from throughout the globe together, all of them caught up in the moment of whatever cultural moment is playing out. It was fun to watch last night as the Cardinals mounted their comeback. A wave of social media barreled to a crash of contrasting tweets dependent on allegiances by the time the game finished. At the climax of the comeback, the tweets and status updates were appearing so fast, I could barely keep up. You cannot kill the Cardinals unless you have a wooden stake and an iron hammer, dressed in garlic. This is one of the most crushing meltdowns in memory for a DC sports team -- up 6-0, twice one strike away from NLCS, and....done. So for 12th time in last 14 years, the team with best regular-season record won't win the World Series. a Is Dusty done in Cincinnati? In all my years of referencing song titles and lyrics in the titles of my posts, I never thought I would – nor had a desire to – reference a Miley Cyrus song. But here it goes. I’ve just finished yet another graduate paper. My professor titled the assignment “Major Thread,” as opposed to our other assignments, which are usually just titled, “Thread.” This was a doozy, worth 100 points, as opposed to our less consuming 20-point or 50-point papers. It required reading 58 pages in a diversity textbook – of which I’m not fond, not because of the content but because I don’t like the way it’s written and presented – and then connecting the text to one of 20 or so topics that were proposed by the professor and dealt with oppression – referencing other texts and materials in the process. I tackled the U.S. Abolitionist Movement of the 19th century. Last night, I worked on the paper in my office from about 6 p.m. until the early morning hours. It’s becoming so routine for me to spend late hours in my office on Tuesday and Wednesdays working on graduate papers that I’m becoming friends with the custodians. Last night they offered me some of their coffee. … Too bad I hate coffee. As it usually goes, there comes a point when my brain hits a wall and I can’t work any longer. So I packed up and headed home, where I slipped into bed at exactly 2 a.m. … But then I was so riled up that I couldn’t sleep. And about a half hour later, Phoebe was at the bedside, muttering that she couldn’t sleep. I got up and escorted her to bed, but the scene played out about a half-dozen more times, with Kates and I trading attempts at taking Phoebe back to her bed and consoling her through whatever was frightening her. For the last couple weeks, Faye has been the one keeping us awake at night as she’s been dealing with an ear infection and coughing fits. Last night was the first time in weeks that Faye slept through most of the night. Instead, Phoebe gave Kates and I the restless night, frustrating us to the point that we woke up this morning and one battered look at each other said it all. “O.M.G.,” Kates said. So far tonight has been a little better, although I’ve yet to hit the bed, so things could change. I participated in my last ropes facilitation course of the semester, grabbed my weekly slice of pizza from the university food court and then headed to my office to finish this week’s “Major Thread.” (Insert the dramatic music … ) … I felt really good about the way I left it last night, and once I got to it tonight, I hit a stride. The ideas and words flowed, and I pumped out the concluding paragraph around 11 p.m. I uploaded it to the course website. And done. But after two marathon nights of writing that paper and climbing walls at this evening’s ropes course, I have almost no feeling in my fingers and wrists. So yeah, I took a ropes facilitation course this fall. It was an elective for my graduate studies. And it was one of the best, most fun course I’ve taken. Every Wednesday afternoon, a couple of my classmates and I drove out to the university’s recreation area a few miles outside of town. We strapped on harnesses and helmets, tied on ropes and climbed until the sun set. The first two weeks of the course were focused on learning the equipment, the knots used for setting up the ropes and climbing and then climbing the alpine tower – a 40-foot, tee-pee-like structure of telephone poles, with platforms at varied heights and ladders and poles hanging in mid-air. More than anything, it sure raises my amazement of this guy to another level. I gained more confidence with each step I took. And it was an awesome workout. I’ve enjoyed it so much I’m sad the class is over. Wednesday nights will never be the same. We did team climbs – where multiple climbers were tied to one another and we had to work together to climb to the top of the tower. We navigated the Odyssey (photo below) – which I think is best described as an entire low ropes course within one apparatus, which is about the size of a football field and suspended about 30 feet in the air. One of the more fun – and stomach-churning – activities we did was last week’s ripcord element. One by one, we were attached to a rope and hoisted by a cable 30-40 feet in the air. Doing the hoisting was our class, running the rope from its anchor like a pack of huskies; it was a pretty amusing process, actually. Then, when the – for lack of a better word – victim was ready, he or she pulled the pin on the cable and went flying. Swinging furiously through the air like a clock pendulum gone berserk. Needless to say, our class got quite a few laughs watching – and hearing – each of classmates reaction at the moment they pulled the pin and lost all control. Still, my favorite element of all was the climbing wall, which we tackled during Week 3 of the class and returned to for tonight’s final class. The wall stands about 40 feet high and features multiple sides – or trails, as they’re known – with varied difficulties. Some of the trails went straight up and some tool the climber up and over angled walls. Some of the climbing rocks were easy to grip, some were not. Some were close together, others required quite a stretch. It was while climbing this element that we latched on to the mantra, “Just go for it.” Because that was pretty much what you had to do to have any success – no matter how far away that next rock, you had to stretch and sort of leap for it. During my first try on the wall a few weeks ago, I completed three climbs – it was my most productive night of the entire course. I completely an easy trail first, climbing all the way to the top of the tower. Then I went for one of the angled trails, but only made it about halfway before my body gave out and I could go no further. … Once I was back on the ground, though, I decided I wasn’t done and went back up on another straight trail – which was arguably the hardest trail of the tower because the grips were so small and spread out. I climbed about two-thirds of the tower before I couldn’t go any further. After that experience, I badly wanted another chance to complete those two trails. We went back to the tower tonight and I wasted no time getting hooked up and starting my climb. But they beat me again … My fingers and wrists tensed up, and I didn’t have the strength to go any further than I did during my first attempts. My hands are sweating now just thinking about it. So the St. Louis Cardinals are moving on to the division series after beating the Atlanta Braves last night. Thanks to the worst call in all of sports since that botched touochdown call in the Packers-Seahawks game a couple weeks ago. I was watching the game in our bedroom, because Phoebe hijacked the living room TV with her Disney Junior programming. I should note that I also was working on my graduate studies, and trying to read the chapters for my next week's paper. Next week marks our mid-term exams, and our assignment is going to be a doozy. Let's be honest, though. I was reading at a snail's pace because my attention was constantly pulled away by the game. I sat up on the bed as I watched the play unfold and thought -- not sure why -- It's gonna fall, it's gonna fall. And it did. The Braves had loaded the bases with one out. They had an opportunity to take the lead, and the game was swinging in their favor now. Just then, there was the sound of a loud thud in the living room. Then "Oweeeeeeeee!" And crying. ... Kates, who was in Faye's room changing her diaper, shouted my name. Throwing down my book and bounding off the bed, I shouted back, "I'm on it!" I hurried down to the living room to find Phoebe awkwardly sitting on top of her child-sized folding chair. The chair was lying on its backside, nearly flattened on the floor, and it had obviously fallen backward with Phoebe in it. You see, Phoebe has a habit of tipping back in her chair while she's watching TV, something we've told her repeatedly -- like a crochety school teacher -- not to do. I scooped Phoebe off the chair and consoled her. With Phoebe settled down and Kates back to the living room, I headed back to the bedroom to resume my graduate reading -- er, baseball watching. Instead, the screen showed members of the Braves' grounds crew cleaning a mess of debris from the field, and suddenly I realized I must have missed something serious on that fly ball. Moments later the analyst showed the replay -- a replay that's been shown a thousand times now -- of the ball falling in the outfield and the umpire apparently calling the infield fly rule. I groaned a loud groan and slapped my hand to my forehead. As the analysts have informed us now, while playing the replay over and over, the infield fly rule hinges on a fielder showing “ordinary effort” and being in position to catch the ball. But gimme a break. The shortstop running back from his regular position and going 40, 50 feet into left field is no ordinary effort. Still, after all that, I'll say this: I love the new playoff format. I thought it was great before, but the one-game playoff for wild card teams adds an exciting new element that's like March Madness for baseball fans. Well done on this one, Bud Selig. a Bobby Valentine fired as Red Sox manager ... No surprise here.